Hell hath no fury like an Indian scorned. 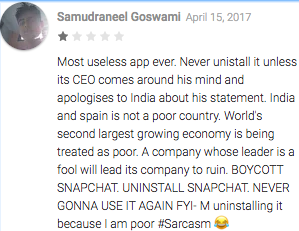 Yesterday, reports had emerged that Snapchat CEO Evan Spiegel didn’t want to expand into countries like India and Spain because they were too “poor”. “This app is only for rich people,” Spiegel had supposedly said. And now Indians are letting Spiegel know what they think of his comments. 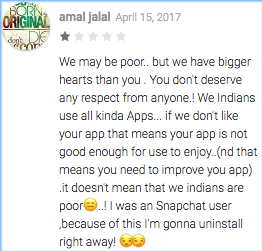 Snapchat’s PlayStore page is currently under siege with tens of thousands of one-star ratings and angry reviews, all around Spiegel’s remarks. Between 4th March and 27th March, Snapchat received 23,000 one star ratings. 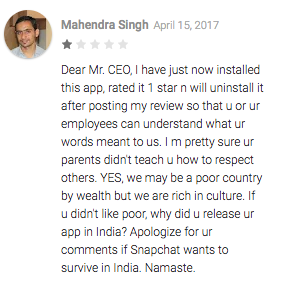 From then to now, it has received 2,37,000 – meaning that over 2 lakh Indians have hit Snapchat with a one star rating over the last 24 hours. “We may be poor, but we have bigger hearts than you,” said Amal Jalal. He went on to add that he was a Snapchat user but was going to uninstall the app because of Spiegel’s comments. Some people are so irate they’re installing the app just to give it a one star, and then immediately uninstalling it. While others are demanding that Spiegel apologize for his comments. This isn’t the first time a corporation has run afoul of Indians. 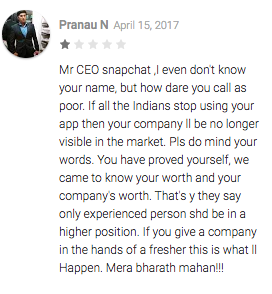 In 2015, Snapdeal had seen a similar situation arise on its Play Store page over comments made by its brand ambassador Aamir Khan. Snapdeal too, had seen its page be taken over, and had received thousands of comments, leading to Snapdeal eventually cutting ties with the Bollywood star. Spiegel hasn’t yet issued a statement in response to the outrage, but the constant negative ratings could soon begin to sting. 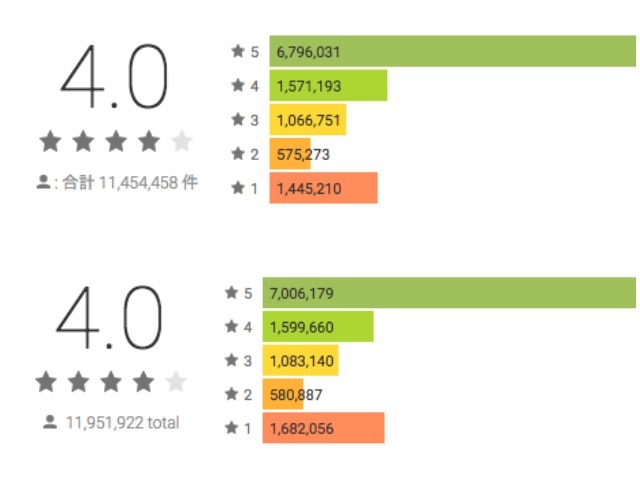 With 200,000 thousands one-star ratings already chalked up, Snapchat might soon fall below a 4.0 on the Play Store. While Spiegel might think that India doesn’t have the monetary might to be of any use to his company, he might soon discover that it has the numbers to hit it where it hurts.